We’d love your help. Let us know what’s wrong with this preview of The Origin Key by S.D. McPhail. Pursuing a criminal known as the Viper, Prince Rasteem becomes suspicious when the Persian army easily conquers Dodrazeb. Princess Laneffri is desp In the third century, the Persian Empire was a world power whose influence stretched from China to Europe. The king and his sons maintained peace with a powerful army—until the day a horde of screaming vandals attacked the king. 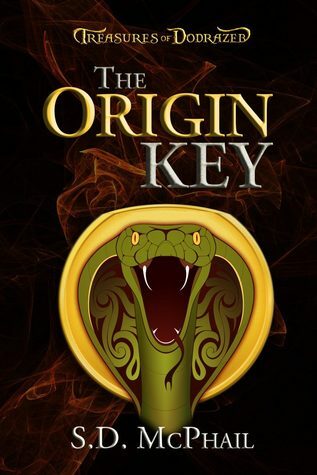 To ask other readers questions about The Origin Key, please sign up. Feels like a historical fantasy with a touch of Lost Horizons. I found it entertaining as a culture clash with both sides suspicious of the other. There is a lot going on involving legends and prophecies. The plotting and the characters pull the concept off in this start of a series. A fun read full of political intrigue, action, and twists. The characters are lively, the setting is exotic, and the author weaves in a rich backstory. Looking forward to reading what S.D. has in store with her next book! This was an interesting book. It started a little different than I thought it would, but it got better as the book went on. I would recommend giving this one a chance. Wonderful read! If you love times of armor & swords with kings and a princess this is the one for you. This is the second of three books I received for free in return for a review. On the whole, the Origin Key was fairly enjoyable with its unusual Persian setting and a distinct main protagonist who is at once temperamental and controlled. As the conqueror of a city-state, he constantly threatens aggression upon his new subjects but rarely follows through, which adds an interesting dynamic to the story and a substantial amount of tension. I found the prose a little weak, but not egregiously so, and This is the second of three books I received for free in return for a review. I found the prose a little weak, but not egregiously so, and the romance didn't feel authentic. One moment the two character's hate each other then he saves (enraging feminists all over the world) and suddenly they're all dove eyes. Mostly it feels like the romance was just tacked on without much thought of attention really devoted to it. These are both small qualms, though. Forget that my mother is the author--I would give the same review if she was a total stranger. This book was well-crafted storytelling, and it was refreshing to have such a unique time and setting. Not many authors have tackled third-century Persia, especially in a sword-and-science fiction narrative, but she did a lot of research and applied it to world building a fictional place in a real setting. I had the pleasure of reading several versions of this prior to the final copy that was published Forget that my mother is the author--I would give the same review if she was a total stranger. This book was well-crafted storytelling, and it was refreshing to have such a unique time and setting. Not many authors have tackled third-century Persia, especially in a sword-and-science fiction narrative, but she did a lot of research and applied it to world building a fictional place in a real setting. "A smart, thrilling mix of history and fantasy. S.D. McPhail is definitely an author to watch." "Treasures of Dodrazeb: The Origin Key is a stunning debut novel. McPhail's creation is packed with tension and excitement, from the political machinations of the empire to the almost Atlantean history of Dodrazeb and mythical Anutupi. The imagery is enchanting, but the adventure is mesmerizing." - Ashley Chappell-Peeples, author of Of War and T "A smart, thrilling mix of history and fantasy. S.D. McPhail is definitely an author to watch." This was a terrific first novel. I enjoyed the mix of historical fantasy and science fiction. I'm looking forward to the next book in the series.